Hi! Hello! Welcome! Before we go any further, I should probably tell you that I'm lying—I'm not Lulu Linden. I'm actually Audrey. But Lulu Linden is the name of my blog! It's also what I would've named myself if I had any say in the matter. Alas, I did not and was named after my aunt, a very lovely lady. I'm a Brooklyn-based writer, journalist and yes, blogger. Since 2014, I've made this little blog a place where I talk about style, makeup, food, travel, relationships, growing up, body image and plain ol' general life sh*t with my Internet girlfriends. It is, for all intents and purposes, a lifestyle blog. I've gotten to do some really cool things because of this blog (see a list of all my really cool partnerships here), but more valuable than any of those things is the fact that, in a world where it's all too easy to get caught up in stats and likes, I've found a group of people who relate to all the nonsense I have to say. Feel free to get in on some of that nonsense, too. 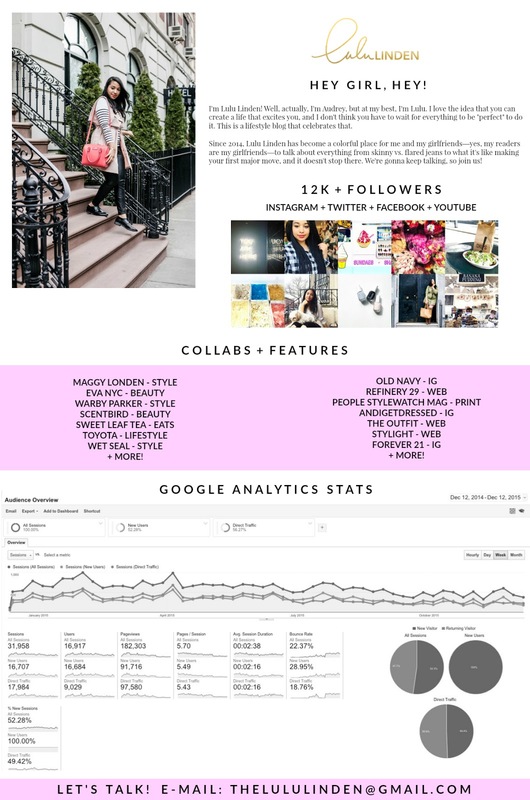 Speaking of stats & likes, here's the Lulu Linden Media Kit!